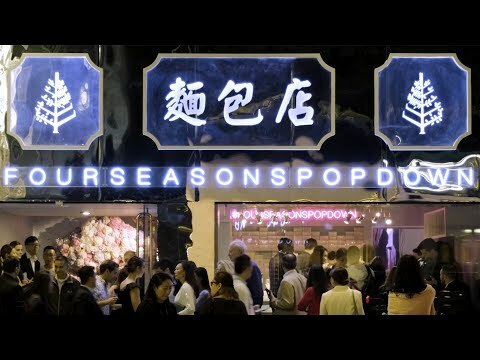 HONG KONG, April 1, 2019 /PRNewswire/ -- For just a few short days, an empty retail space in Hong Kong’s Central district became a Four Seasons experience. The world's leading luxury hospitality company hosted Four Seasons Pop Down Hong Kong, the fourth in a global series of immersive events, this time coinciding with the final flourish of Hong Kong's art season. 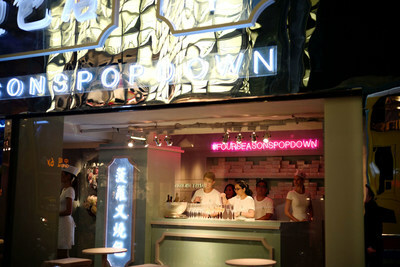 Nothing was as it seemed at Four Seasons Pop Down Hong Kong, the fourth in a global series of immersive events. 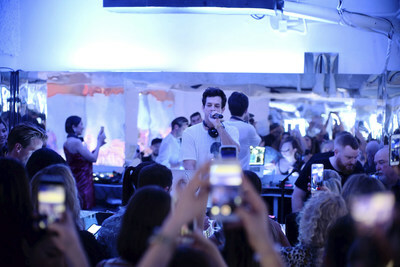 Acclaimed producer and DJ Mark Ronson headlined the invitation-only experience. Michelin-Star Chef Chan Yan Tak of Lung King Heen at Four Seasons Hotel Hong Kong. Simone Zanoni of Four Seasons Hotel George V, Paris. Nothing was as it seemed: Slipping in through what appeared to be a refrigerator at the back of a traditional Chinese bakery, an elite guest list of celebrities, influencers and VIPs from around the world was soon immersed in a world of illusions. 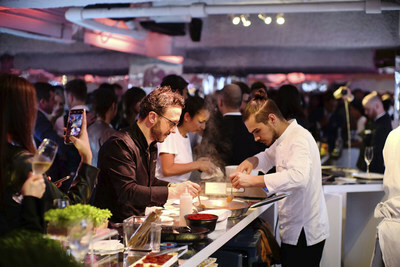 Mirrors, lights, sounds and surprises during #FourSeasonsPopDown Hong Kong captured the world's imagination through shared images and stories, while an international cast of Four Seasons master chefs and mixologists presented savouries, sips and sweets to enchanted guests. Grammy and Academy Award-winning songwriter, musician, producer and DJ Mark Ronson headlined the evening's entertainment, with additional musical interludes by Hong Kong sensation Miss Yellow, lauded as one of the world's hottest female DJs. The first Four Seasons Pop Down in Asia also featured world-renowned culinary artists Chan Yan Tak of Lung King Heen at Four Seasons Hotel Hong Kong, Guillaume Galliot of Caprice at Four Seasons Hotel Hong Kong, Simone Zanoni of Four Seasons Hotel George V, Paris, Marshall Allen Röth of Four Seasons Hotel Abu Dhabi at Al Maryah Island, and Anchalee Luadkham of Four Seasons Resort Chiang Mai. Shaking things up with their original cocktails were Lorenzo Antinori of Four Seasons Hotel Hong Kong, Keith Motsi of Four Seasons Hotel Seoul, and Philip Bischoff, who is leading the bar program at the new Four Seasons Hotel Bangkok at Chao Phraya River opening later this year. Sweet indulgences were created by Yusuke Aoki of Four Seasons Resort Bali at Jimbaran Bay, Chris Ford of Beverly Wilshire, A Four Seasons Hotel, and Lorenzo Sollecito of Four Seasons Hotel Jakarta. Unexpected twists continued through food and drink, whether through a new bubbly take on Milk Tea, or in edible spa stones found in miniature doors along a mirrored wall, to a Thai spin on a traditional taco. Guests could explore culinary creations from around the world all while delighting all of their senses. The sweet, pastel-hued décor of Four Seasons Pop Down included floral accents by renowned Tokyo-based artist Nicolai Bergmann. 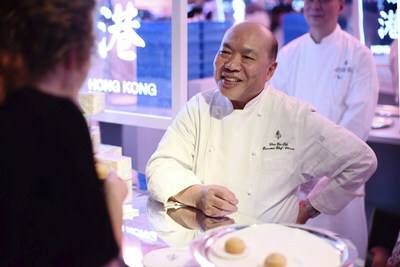 For the first time ever, Michelin-Star Chef Chan Yan Tak's pineapple pork buns can be enjoyed outside of Lung King Heen at Four Seasons Hotel Hong Kong – the world's first Cantonese restaurant to earn three Michelin stars, also just named one of Asia's 50 Best Restaurants. For two days only, a tiny storefront in Central will transform into a Four Seasons experience as Chef Chan Yan Tak serves up this signature treat along with his beloved baked cream custard puffs. They will be packaged in collectible boxes created by local illustrator Don Mak exclusively for this occasion. Doors open at 11:30 am on April 1 and 2, 2019 only. The treats are complimentary. Enjoy while they last! The fifth Four Seasons Pop Down will make an appearance in Europe later this year, with details – including featured artisans and a surprise venue – to be announced at a later date. For the latest news on Four Seasons Pop Down events, themes and locations, follow @FourSeasonsPR #FourSeasonsPopDown and visit press.fourseasons.com. Four Seasons Pop Down Hong Kong was the fourth in an innovative series of immersive global events in unexpected locations, each with unique themes brought to life by a selected team of Four Seasons artists and visionaries from around the world. Four Seasons Pop Down was launched in Toronto in 2017, followed by Philadelphia in September 2018 and Miami in December 2018.